Fewer than 10 percent of the nation's 17,875 franchise dealers use Facebook advertising to any degree even though it's a fairly inexpensive way to get in front of shoppers. 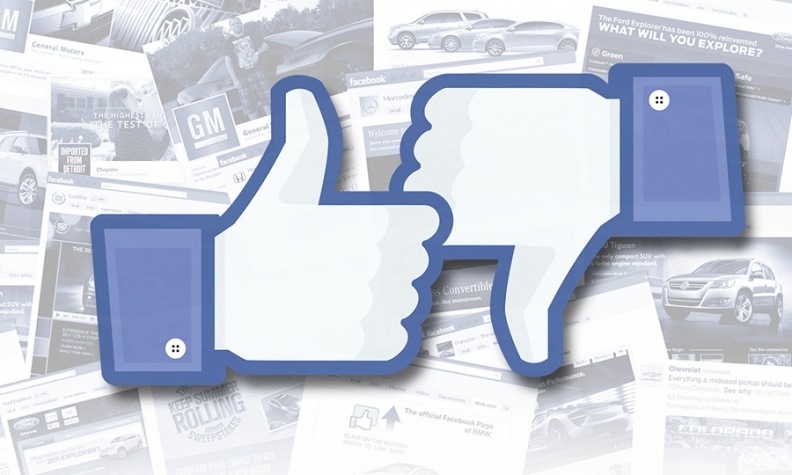 Pat Hayes epitomizes why dealers have been reluctant to advertise on Facebook. After spending about $1,500 a month for Facebook ads for six consecutive months in 2013, Hayes, who is a sales manager at Patriot Ford near Oklahoma City, couldn't point to a single vehicle sale the advertising had definitively produced. "I'm not sure we sold any. Maybe two," Hayes said. "We canceled because we were getting zero results." Meanwhile, down in Rosenberg, Texas, outside Houston, Paul Lappage is gung-ho on Facebook ads. 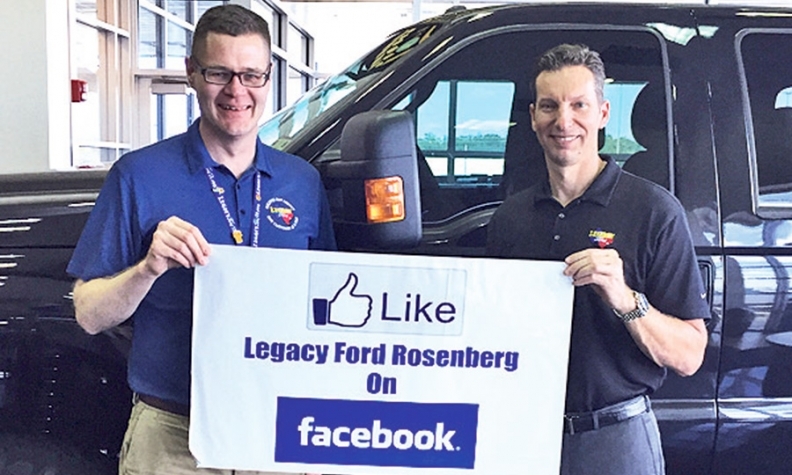 The e-commerce manager of Legacy Ford says the store converted several new-vehicle sales from its $1,000 monthly spend on Facebook ads for promotions surrounding the World Cup tournament, football games and local events. "The advertising works if you have something to engage people," Lappage said. The differing outcomes help explain why the vast majority of dealers are sitting on the sidelines. Fewer than 10 percent of the nation's 17,875 franchise dealers use Facebook advertising to any degree, said Dave Winslow, vice president of digital strategy for software vendor Dealertrack -- even though it's a fairly inexpensive way to get in front of shoppers. Part of the hitch is that some have tried it and not seen results, Winslow said. Others have kept Facebook advertising on the back burner as they spend more on paid-search advertising on Google or ad retargeting, which delivers ads to customers across the Web based on their browsing history, Winslow said. Then, there is still some residual caution left by General Motors' decision two years ago -- since reversed -- to very publicly drop all its Facebook advertising, he said. That's ironic because the automakers generally use Facebook heavily to build engagement with their brands. "In general, dealers are under-indexed on digital advertising," Winslow said. Alex Jefferson, a Facebook proponent who is e-commerce director of the three-store Proctor Dealerships based in Tallahassee, Fla., said Facebook ads cost the group between 30 cents and $1.50 for every visitor they attract to their dealership websites. That compares with $2 to $4.50 spent for Google paid-search ads. A Facebook spokesman declined to discuss how much advertising the automakers or their dealers buy. But the company said it's releasing new advertising features to help dealers target shoppers locally based on their likes and the age of their vehicles, for instance. "We are just now beginning to see our development community release products to handle the scale of dealer solutions," said Michelle Morris, vertical manager for autos at Facebook. "We have presented to thousands of dealers already this year and are working on dealer-specific collateral and how-to guides." Across industries, ad revenue is surging at Facebook. In the second quarter, it reached $2.68 billion, up 67 percent from a year earlier. Facebook's mobile ad revenue was particularly strong, representing 62 percent of its ad revenue in the quarter. Legacy Ford's Paul Lappage, left, and Patrick Sexton have had success with promos on Facebook. Patriot Ford's Hayes said Facebook has been good for promoting the store through community activities, including a salute to local service members it does with the University of Oklahoma during Sooner football games. He said he sees that kind of engagement, and managing consumer reviews, as the proper use of social media. For sales, though, the results have been dismal, Hayes said. Not only did he not get any, he said, but customers told him that they disliked getting ads on their Facebook newsfeeds or in the right-hand column where ads appear. He said that unless they are really passionate about a subject (guns are an example, Hayes notes), Facebook users tend to want to share photos and conversations with friends and family rather than buy stuff such as a car or tires. Patriot Ford sells about 130 new and used vehicles per month. "It's hard to elicit an emotional response for an oil change," Hayes said. At Legacy Ford, though, Lappage says he's making it work. For example, in July, the store lured customers to its Facebook page with a contest offering a Ford certified pre-owned vehicle to anyone who filled out a perfect bracket for the World Cup soccer championships, he said. The contest drew 124 contestants and 453 visitors to a special Facebook landing page on the store's website. Of those visitors, four eventually bought vehicles -- three of them new to the dealership, Lappage said. Nobody won the contest, but the dealership gave away other soccer-themed prizes in random drawings. The Facebook ads for the contest cost $1,000, out of a monthly digital advertising budget of about $12,000, he said. Social media vendor Digital Air Strike helped with ad creation and consumer targeting, he said. The store spent a similar amount for Facebook ads during a dealership promotion last December involving a holiday light show at the Houston Zoo. Customers who took a test drive got free tickets to the show and were entered to win the grand prize of a weekend's use of a Ford Edge crossover, he said. The promotion yielded 10 test drives by people who responded to the Facebook ads. Two of the customers bought Edges, and two bought Ford Fusions. Legacy Ford sells about 200 new and used vehicles per month. Lappage said 85 percent of the store's Facebook advertising is aimed at vehicle sales and 15 percent at getting more service business. But it's always a soft sell, said store general manager and partner Patrick Sexton. Legacy Ford dispensed with posting inventory on Facebook years ago when consumers disliked it, he said. This month, the store hosted a free beer tasting, featuring Texas microbrews, for those coaxed to the dealership to watch an NFL game between the Houston Texans and Dallas Cowboys. A local beer distributor sponsored the tasting, Lappage said. Facebook ads rang the bell on the event. Lappage said, "We're always looking for what's appealing to people and maybe spin off a vehicle."